Last Week in Review: The labor market showed signs of improvement while the harsh winter continued to impact housing. Forecast for the Week: The Jobs Report for March will be important to dissect, plus several key manufacturing reports will be released. View: Check out these simple secrets to a better business mind. "The world is but a perpetual see-saw." Michel de Montaigne. Last week, the news saw its fair share of ups and downs as economic reports were mixed. Read on for the details and what they mean for home loan rates. The housing market continued to battle the harsh weather across much of the nation, as New Home Sales declined to a five-month low in February, coming in at 440,000. Pending Home Sales also declined in February while the Case Shiller 20-city Home Price Index rose 13.2 percent annually in January. This was down from the 13.4 percent in December and lower than expected. It will be important to see if the housing market improves as the weather warms around the country. In labor market news, weekly Initial Jobless Claims fell to a four-month low of 311,000. In addition, the four-week moving average of claims, which irons out seasonal abnormalities, declined to 317,750–the lowest level since September. The drop in claims signals an improving labor market, but we'll have to see next week's Jobs Report for March for further confirmation. Consumer Confidence rose to 82.3 in March, well above both expectations and the reading in February. This was the highest level since January 2008. Americans surveyed were more positive on future job prospects. It is important to note that March's Consumer Sentiment Index, which provides a similar reading, fell to its lowest level since November. What does this mean for home loan rates? Beginning in April, the Fed will purchase $30 billion in Treasuries and $25 billion in Mortgage Bonds (the type of Bonds on which home loan rates are based) to help stimulate the economy and housing market. This is down from the original $85 billion per month that the Fed had been purchasing. With the final reading for fourth quarter 2013 Gross Domestic Product coming in at 2.6 percent, well below the third quarter reading, the Fed will be closely watching upcoming reports as it evaluates the timing of further tapering. These decisions will continue to impact our economy and home loan rates as we move ahead this year. The big news of the week is the Jobs Report for March that will be released on Friday. Manufacturing data from Chicago PMI and the ISM Index will be released on Monday and Tuesday, respectively. In labor market news, the ADP Employment Report will be delivered on Wednesday, followed by weekly Initial Jobless Claims on Thursday. Also on Thursday, look for the ISM Services Index, which is a national non-manufacturing index. That leads us to Friday's Non-farm Payrolls and the Unemployment Rate, which will be closely dissected by both Wall Street and the Federal Reserve. To go one step further–a red "candle" means that MBS worsened during the day, while a green "candle" means MBS improved during the day. Depending on how dramatic the changes were on any given day, this can cause rate changes throughout the day, as well as on the rate sheets we start with each morning. 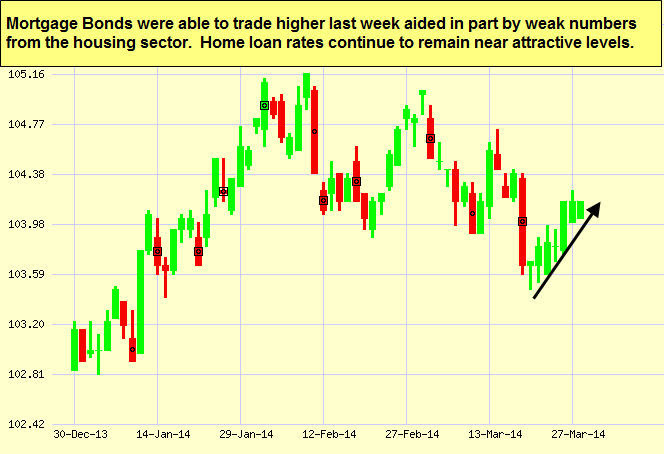 As you can see in the chart below, Mortgage Bonds were able to improve last week, aided in part by weak housing news. home loan rates remain attractive and I'll be watching their movement closely. 3 Secrets to a Better Business MindIt's commonly held that intelligence is set from birth, meaning there's no way to "boost" brainpower. But many studies prove the opposite. A combination of lifestyle adjustments and mental exercises can not only increase intelligence, but also improve general brain health. The following tips can help boost mental activity and increase your intelligence...all of which helps your business! 1. Keep Memorizing. There is no shortage of contemporary studies that show a powerful correlation between a strong working memory and overall intelligence. A good memory has also been shown to slow down mental aging. Start small by memorizing your to-do list or daily schedule, then step it up a notch and memorize scripts that can help you during meetings with clients. If you want to take it to another level, try learning a new language and use it to expand business contacts in your community. 2. Mix it up. Do you have the exact same routine every single day? Falling into rigid patterns promotes mental passivity, or the opposite of stimulation. So, try mixing things up a bit. Challenge yourself by participating in new activities. Join a softball league, a reading club, or even a theater group, which are not only fun but also great ways to expand your connections in your community. At the very least, play around with your daily schedule. The point is that too much regimen can dull the senses. 3. Exercise. In his book Spark: The Revolutionary New Science of Exercise and the Brain, author John J. Ratey, M.D., says if you want clear thinking, stress reduction, relief from depression, and more confidence in yourself, you only have to do one thing: exercise. All of which is sure to result in a better bottom line for your business, too! Start implementing these easy tips todayyour brain and your business will benefit.